On a positive note, children can have a powerful impact on the adults in their lives if they have access to the right resources and support services. Learning about these support systems, and how to use them to get help for addicted parents, can change the course of a child’s future and may help a parent begin the recovery process. In a healthy parent-child relationship, the parent takes on the role of the caregiver, providing physical shelter, emotional support, and financial security for a young person who is still developing. In parent-child relationships that involve substance abuse, however, these roles are often reversed, and the child assumes the role of the caregiver. Many children are not even aware that they have taken on this responsibility. Some of the “duties” of a child-parent are obvious, like helping an intoxicated father clean up after a night of heavy drinking or getting a part-time job to help cover the cost of groceries. But these responsibilities may also involve a level of emotional intimacy that exceeds the boundaries of a healthy parent-child relationship. In all of these scenarios, the child is asked to assume a level of maturity that they may not be ready for. Addicted parents often infringe on the emotional boundaries that allow children to develop independently, turning the child into an expert caretaker who lacks social skills or a sense of personal identity. According to the Partnership for Drug-Free Kids, the emotional and mental stress of having to care for themselves and for intoxicated parents can harm a child’s brain development. In addition, children who must provide for themselves because their parents are physically or mentally absent are at higher risk of injury, exposure to crime, malnutrition, and isolation from their peers. Children whose parents are often drunk or high may be embarrassed to bring their friends home. As a result, their lives may become so restricted that they fail to develop strong relationships with their peers. Worst of all, a lot of kids believe that the parent’s addiction is somehow their fault — that if they were better behaved, earned better grades in school, or took care of all the chores at home, their parents wouldn’t be so tired or stressed and wouldn’t have to medicate themselves with drugs. Young people who find themselves in this situation need to feel empowered to step outside of the caregiving role and get help for themselves. For children who are trying to be their own caregivers or who are parenting their parents, it isn’t always easy to find help outside the home. Children of addicted adults are often discouraged — sometimes through outright intimidation or emotional manipulation — from talking with other grownups about problems they’re experiencing. Parents with substance abuse issues may become angry or abusive if they feel that a child is “betraying” the family by exposing its secrets to a school counselor, teacher, doctor, or a friend’s parent. Many parents are also afraid of the very real possibility that if their substance abuse is exposed, they might lose legal custody of their children and face criminal charges. To make matters worse, growing up in a home affected by substance abuse can damage a child’s self-esteem, making it even more difficult to approach a sober adult or the authorities. This situation can lead to extreme anxiety, fear, and a profound sense of helplessness. 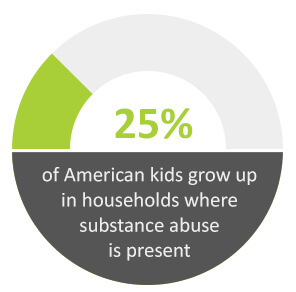 The National Council of State Legislatures (NCSL) lists parental substance abuse as one of the most common reasons that children run away from home or become homeless. In addition, NCSL reports that 46 percent of underage runaways are the victims of physical abuse, and 38 percent are the victims of emotional abuse — both of which are common in homes where an adult abuses alcohol or drugs. How can kids build self-confidence and get past the fear that keeps them from speaking up about a parent’s substance abuse? Find an adult to confide in. Think of at least one older person you respect and trust, someone who understands you and makes you feel valuable. It could be a teacher, a coach, a favorite aunt or uncle, or a neighbor. Let them know about your fears, and ask them if they would be willing to help. Keep a journal. Writing down your feelings — either in a paper journal or an online blog — and recording the things that happen to you might feel scary at first, but it’s a good way to work through your fears. A journal can also be a good way to remember things that have happened when you make the decision to talk to someone. If journaling isn’t your thing, try expressing yourself in other ways, like recording videos, composing poems, making art, or writing songs. Participate in activities that make you feel good about yourself. Are you a fast runner? A gifted photographer? A music lover? Find the activities that make you feel confident and happy, and spend more time participating in those things. Stay close to your friends. When you’re feeling embarrassed or frightened about things that are happening at home, it’s tempting to isolate yourself and lie to your friends about how things are going. Don’t turn your friends away in these tough times; find at least one person your age who makes you feel good about yourself, and keep in touch with them. Collect emergency phone numbers. Make a list of people you could contact in a crisis, and keep their phone numbers in a safe place. These numbers could include emergency services, teen hotlines, relatives who have helped you in the past, concerned neighbors, teachers, or anyone else you feel you could turn to if things get really bad. Make a list of safe places. If there were a crisis at home and you needed to leave, either for an afternoon break or a whole night, where could you go? Keep a list of places — the homes of friends or relatives, family shelters, teen centers, libraries, and parks — where you could go if you need relief from stress at home. Remember, it’s not your fault. When you find yourself feeling guilty or upset about a parent’s substance use, remind yourself that you are not the cause of your parent’s problem. You can’t control another person’s substance use. You can’t cure them of the disease of addiction. What you can do is build your own strength by reaching out for help. Support groups like Al-Anon and Alateen are great places to turn when you feel overwhelmed by another person’s addiction. Our society’s opinions about substance abuse play a big part in the way we respond to those who get addicted to intoxicating substances. Although addiction is now recognized as a chronic disease of the brain, many substance users who desperately need help are still judged or condemned. Parents, in particular, are vulnerable to judgment, criticism, and legal repercussions because of the effects of substance abuse on their children. Condemning parents does not necessarily help them or their children. Instead, the social stigma against addicts and alcoholics discourages both parents and children from reaching out for help. In her account of her childhood growing up with an addicted father, author Alana Hope Levinson describes how the shame of having a parent who abused drugs prevented her from reaching out to others for support. 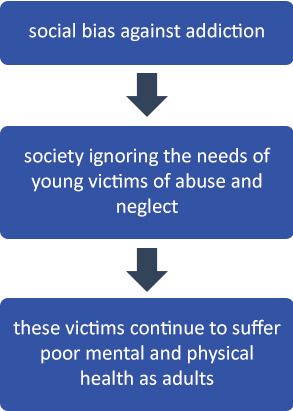 Levinson writes that this social bias against addiction leads to a “conspiracy of silence,” in which society ignores the needs of young victims of abuse and neglect. As a result, many of the kids who grow up in households affected by addiction continue to suffer poor mental and physical health as adults. I have the right to speak up. I have the right to get help. The repercussions of growing up with addicted adults do not end with adulthood. In a landmark study of the long-term effects of childhood neglect, researchers found that children who grow up in abusive home environments had a higher risk of developing chronic health problems as adults. Through this project, the Adverse Child Experiences (ACE) study, data was collected from 17,000 adults participating in physical exams through Kaiser Permanente. Revisiting the past can be painful, and it can be extremely uncomfortable to confront aging family members about past behaviors. With the support and guidance of a counselor, 12-Step fellowship, or spiritual leader, reviewing the past can be much more productive and rewarding. Adults who are current substance abusers can find healing and self-discovery through a rehabilitation program that includes medical detox, intensive counseling services, peer group support, and family or couples therapy. Talking to a parent about getting help for substance abuse can be extremely intimidating. To some kids, addressing the problem seems like a betrayal of the parent’s trust; to others, it might be a frightening violation of authority. One of the most important things to remember about addiction is that it can distort the user’s sense of reality, hiding the true impact of the disease. Many parents may not be aware of the effects of their drug use on their kids. They may be so deep in denial that they don’t realize how chaotic their children’s world has become. Listed below are seven steps you can take to make a conversation with your parent more successful, whether you’re a young person who’s still dependent on your parent or the independent adult child of an addicted person. 1. Write down your feelings first. Before you approach someone about the topic of addiction, it’s best to clarify your own feelings in writing. People with substance abuse problems are likely to get angry, defensive, or manipulative when they’re confronted. They might yell or cry, and blame you for their problem. When you have your feelings set down in writing, you can turn back to those words when things get tough. 2. Get help from someone with experience in interventions. There are a lot of professionals who have experience at talking with people who are abusing alcohol or drugs. This kind of conversation is often known as an intervention. You probably have someone in your life who could help you arrange an intervention: a counselor, school nurse, coach, priest, or rabbi who can help you set up a meeting with a parent or refer you to someone who can act as an intervention leader. 3. Ask other relatives or concerned persons to participate. If someone in your life is abusing substances, it’s likely that other people are affected too. These people might include siblings, aunts or uncles, neighbors, or employers. Any of these people could help you state your case when you talk with a parent; remember, there’s strength in numbers. 4. Arrange a time when your parent will be sober. When you approach a parent about drinking or drug use, it’s best to talk to them when they are clearheaded and sober. Talking to someone who’s high, drunk, or hungover probably will not be productive. 5. Keep the conversation calm. It’s hard not to get angry, upset, or emotional when you’re talking with someone about the damage they’re doing to themselves and to the rest of your family. But if you can stay reasonably calm and avoid outbursts of emotion, you’ll be able to express your feelings more clearly, and in the end, you’ll be more persuasive. 6. State your expectations clearly and in writing. Before you talk with a parent about substance abuse, make sure you know what your goals and expectations are. Do you want them to go to rehab? Go to an Alcoholics Anonymous meeting? You can work on these goals with the person you chose to help you in Step 2, then write them down in the form of a recovery plan or agreement. Other people in your life, such as relatives, employers, or spiritual leaders, can help you set these goals. 7. Get help making sure your parent follows through. People who are confronted about their substance abuse may promise to get clean and sober, and a lot of times, they mean it. But addiction is a powerful disease, and it’s easy to fall back into old habits, especially where intoxicating drugs are concerned. You’ll need at least one strong person to help you make sure your parent goes through with the promise to go to detox or rehab, and to follow up with them on a regular basis. Detox: In this stage, drugs and alcohol are cleared from the body, so the client can become medically stable. Detox prepares the body and mind for the more intensive work of rehab that will follow. People going through detox can experience uncomfortable withdrawal symptoms, like anxiety, cold sweats, tremors, nausea, vomiting, and muscle pain. They may also have unpleasant emotional and behavioral responses, like depression, mood swings, irritability, or irrational anger. Inpatient or residential rehab: Many clients, especially those who have a long history of substance abuse or severe addiction, choose to go to an inpatient treatment center or residential rehab facility after detox ends. This stage may take place in a hospital, specialized inpatient unit, or a dedicated recovery facility. During this time, your parent may be away from home if they need 24-hour care. At an inpatient facility, clients participate in individual therapy sessions, group counseling, family therapy, support groups, and other activities that will help them learn how to avoid alcohol and drugs in the future. Outpatient rehab: Clients who are motivated to quit and stable in their early sobriety may go straight from detox to outpatient rehab. Outpatient rehab involves going to classes and therapy sessions in a treatment facility or clinic outside the home while going home at night. Some people continue to work while they are in outpatient rehab, while others spend the entire day in recovery activities. Outpatient programs typically last four or more weeks. Clients who have finished an inpatient program may transfer to outpatient rehab when they no longer need a highly structured, supervised environment to stay sober. Aftercare services and sober living homes: After a rehab program ends, many facilities provide aftercare support services. These services may include therapy sessions at the facility, access to self-help groups, membership on social media sites, family weekends, workshops, volunteer activities, recreational events, and more. For clients who need a transition between rehab and their former life at home, sober living houses provide a place to live in the community while practicing new coping skills. Parents who have been through a rehab program can experience a wide range of emotions, from gratitude and joy to depression, anxiety, and anger. Kids must remember that these emotional responses are natural, and they should be handled with the help of a professional therapist or support group. Children are not responsible for the outcome of rehab or for their parents’ continued sobriety. In the months following rehab, it’s more important than ever that young people have their own support system — including therapists, friends, and sober family members — to help them understand the nature of addiction and recovery, and to know what to expect from their parents after rehab. Sobriety is not always easy, and kids may be surprised or frightened by their parents’ new behaviors. Exchanging one addiction for another: People in recovery may switch from one addictive substance or activity to another as they learn to cope with the challenges of sobriety. For instance, a recovering alcoholic may start using coffee, tobacco, or food as a substitute for drinking. This behavior is not necessarily harmful; it may just be a transitional phase that will eventually resolve as the individual becomes more comfortable and confident with abstinence. Experiencing strong emotions and mood swings: In sobriety, people have to confront the emotions that they suppressed when they were drinking or using drugs. These emotions may include resentment, anger, fear, anxiety, or guilt. It’s not uncommon for recovering individuals to struggle with emotional outbursts or to switch from one emotional state to another in a fairly short period of time. Individual and group therapy can help clients manage these responses. Extreme mood swings or frequent outbursts, however, could point to an untreated mental health disorder and require psychiatric help. Expecting to have a close relationship before a child is ready: After a parent finishes rehab, children will have their own emotions and resentment to deal with. Memories of abuse and neglect do not fade quickly or easily, and children may find that they don’t trust the sober version of their parent. Parents who want to reconnect with their kids before the child is ready may be disappointed. Likewise, a child might resent a parent who expects to have an immediate bond after years of emotional distance. Family therapy is crucial during this phase to help parents and children repair broken bonds and restore trust. Relapsing back to substance abuse: Relapse is one of the most difficult outcomes for kids to accept. After investing so much hope in rehab, it can be devastating to see a parent fall back into drinking or using drugs. Kids must learn that as hard as they work in recovery, and as much as they hate the idea of falling back into the trap of addiction, most people who abuse substances will relapse at least once. Relapse does not mean that rehab has failed or that a parent will never get sober. But it does mean that the parent may need more intensive support to get back on track with their goals. Once again, kids must remember that they can’t control the outcome — good or bad — of a parent’s recovery. Finding a good rehab program that meets your needs can be the first step in a lifelong journey of recovery. You can start that journey by researching programs in your community and by talking with people who have experience in substance abuse treatment. Our parents’ behavior shapes who we are, but it doesn’t have to limit our future or prevent us from becoming strong, successful, sober individuals. Adverse Childhood Experiences (ACE) Study: This website from the Centers for Disease Control and Prevention (CDC) describes the purpose and scope of the original ACE study, along with current data about the repercussions of childhood neglect or abuse in later life. Ideas for preventing adverse childhood experiences and resources for adults and children seeking recovery are also provided. Adult Children of Alcoholics (ACoA): ACoA is a recovery fellowship for individuals who grew up in households with one or more alcoholic adults. This group, based on the principles of the 12 Steps and 12 Traditions of Alcoholics Anonymous, provides support and resources at no charge. Alateen: This website provides information, literature, and a meeting locator for Alateen, a 12-Step fellowship that offers experience, strength, and hope to young people affected by substance abuse. Membership in Alateen is free, and meetings can be found in most major communities. National Association for Children of Alcoholics, Just4Kids and Just4Teens: The NACoA is a nationwide nonprofit organization that connects families, kids, and teens affected by alcoholism with the resources they need to stay safe and healthy. The Just4Kids and Just4Teens pages include FAQs and resources for young people in need of emotional support and guidance. National Institute on Drug Abuse: For Teens: This online resource provides links to fact sheets about intoxicating substances, access to treatment resources, and support services for young people. National Runaway Safeline: This confidential hotline offers support, crisis intervention, resources, and educational information for youths who have run away from home or who are thinking about running away. Parental Substance Use and the Child Welfare System: This guide from the Child Welfare Information Gateway is directed at therapists and other addiction treatment professionals; however, it contains valuable information and statistics for the general public about the impact of substance abuse on families, and on children in particular. Substance Abuse and Mental Health Services Administration (SAMHSA): National Helpline: This free support and referral service is available to anyone with questions about substance use disorders or mental health issues, including the children of addicted parents. Calls are kept completely confidential, and the service is available 365 days a year, 24 hours a day. The helpline’s website also provides links to online educational materials about substance abuse and mental illness. TeensHealth: Coping with an Alcoholic Parent: This resource guide from the Nemours Foundation explains the disease of alcoholism and gives kids ideas and resources on how they can improve their self-esteem, get help for an alcoholic parent, and find support for themselves.